I few weeks ago I cooked tempura for the first time as it formed an element of my music and food related post on Godspeed You! Black Emperor, connecting post rock to slow cooking. 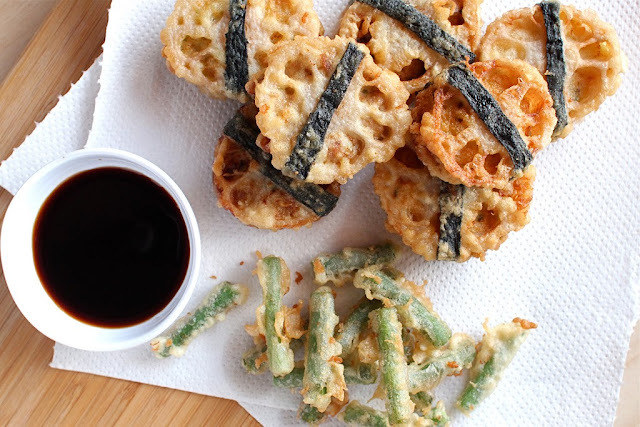 I have battered and deep fried food before but never using the Japanese tempura method which has a signature light and crisp texture that covers food in a wispy lacy fashion. “The absolute epic Japanese izakaya treat would be these as a triple decker sandwich for tofu and meat and then made into tempura – renkonhasamiage”. Imagine a morsel of crunchy slices of lotus root sandwiching a delicious meat filling, wrapped in nori, battered and deep fried. This is a deep fried burger done right. Using a light tempura batter means that it doesn’t feel heavy or is as greasy as other fried foods. And the best thing? Well unlike a normal burger which can be a challenge to eat as it’s a delicate balancing act trying to minimize the exit of fillings as you bite into it, everything in the tempura burger is compacted in. There is also no risk of dislocating your jaw, a challenge presented by most burgers when you try to fit the tower bun, meat, vegetables etc. into your mouth all at once. But its bite size makes it dangerous, as one is never enough and you can easily eat dozens of them. 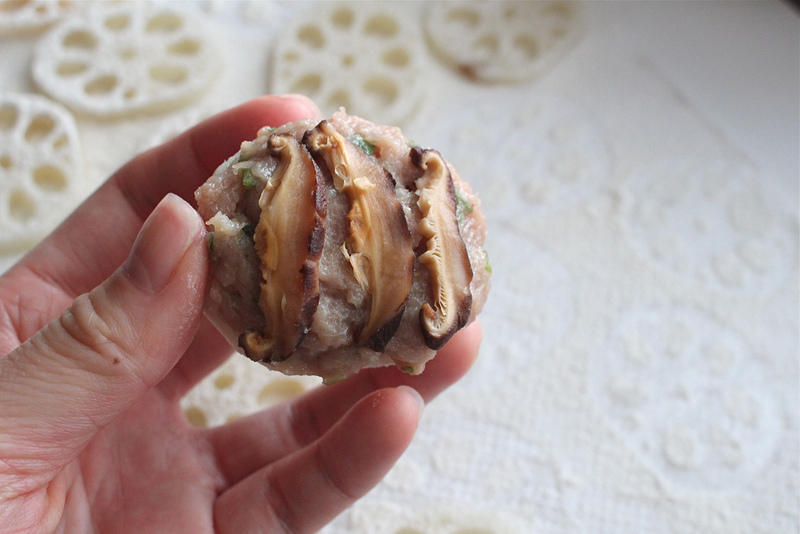 Renkon Hasami Age – “renko” is lotus root, “hasami” means to put in between two things (like a hamburger!) and “age” refers to frying. 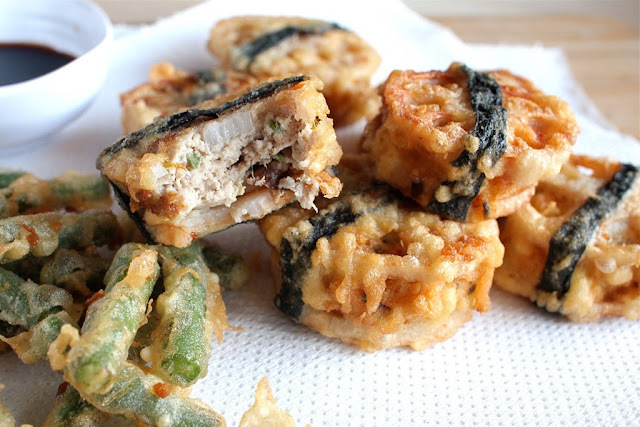 I’m a huge fan of Japanese fried food especially Chicken Kaarage but Renkon Hasami Age has surpassed it as my new favourite fried food. I’ve never seen this on a menu in Perth but it can be easily made at home. Burgers. Chips. Soy Sauce for dipping. How to make Tempura Burger! 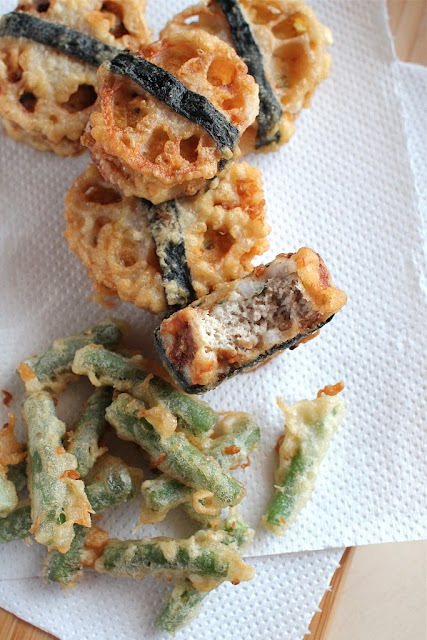 As I was researching how to make tempura, I found out what makes it different from all the rest. It’s a very light batter comprising of just flour, water and egg. The batter needs to be cold for the signature light and crisp texture that covers food in a wispy lacy fashion, so I refrigerated the flour and used water with ice cubes in it. Throughout the deep-frying process, I would keep the batter cold by dropping in another ice cube, every now and then. 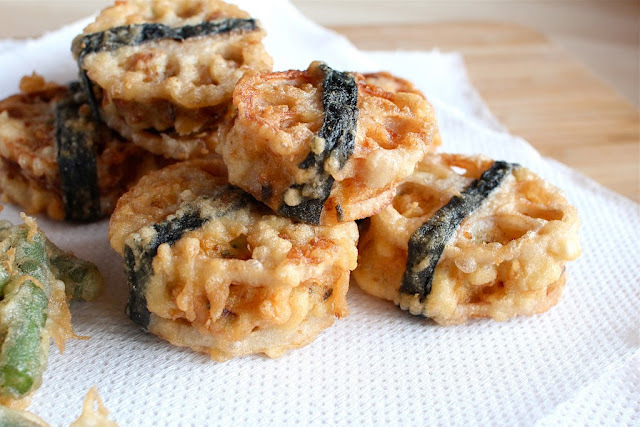 The batter ingredients are mixed for only a few seconds using chopsticks to loosely fold it together (to avoid the activation of gluten which will make the mixture chewy and dough-like when fried) and it’s ok if there are lumps in the mixture. The batter also needs to be made fresh, just before frying as it shouldn’t stand too long. Add all the ingredients into a food processor and process until it all sticks together and has developed some elasticity. 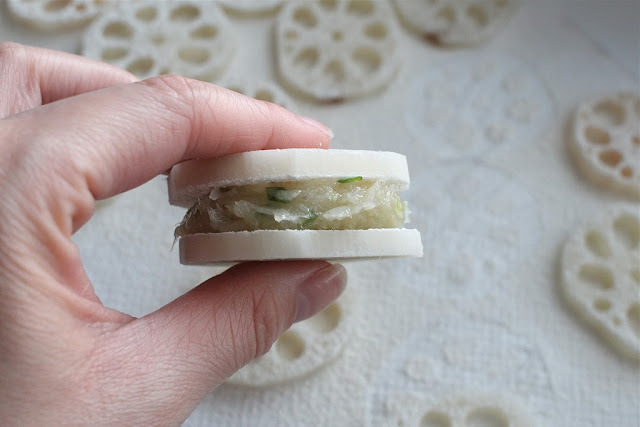 Plus – nori sheets cut into strips and lotus root. 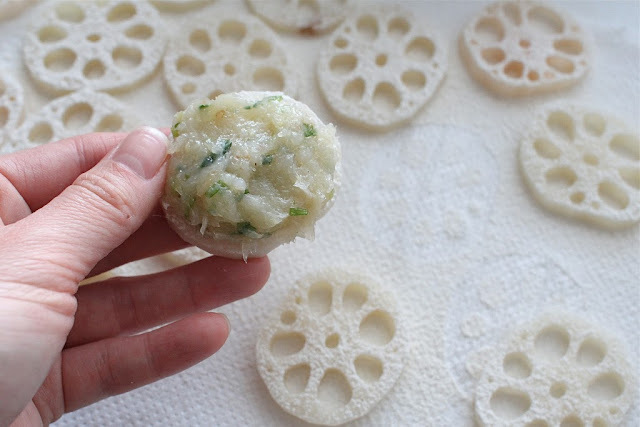 Wash, peel and thinly slice the lotus root – soak in a large bowl of water with a dash of vinegar (this prevents it from darkening). Drain the lotus root slices and pat dry. Lightly dust one side of the lotus root slice with flour (to help the meat stick to its surface). 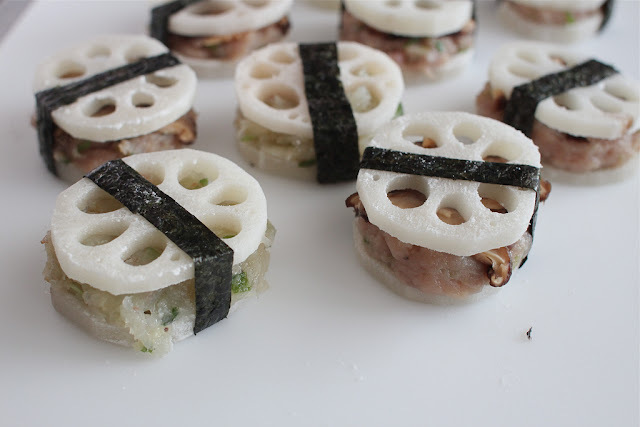 Take a slice of lotus root (flour side up) and spread a small amount of the meat mixture on top and sandwich with another slice of lotus root (flour side down). For the pork filling, add thin slices of shitake mushrooms on top. Seal the filled lotus root with a nori strip, wrapping it around the tempura burger. 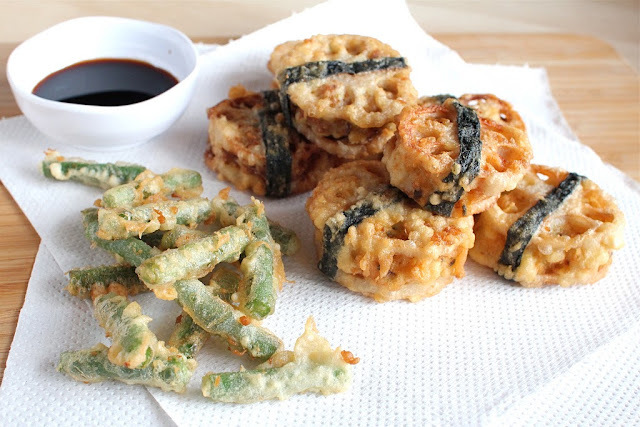 In a pot, heat up vegetable oil until it is between 160C-180C and deep fry the tempura burger for a few minutes until it is golden brown all over. NB: Scoop out bits of leftover batter/crumbs from the oil between frying so that they don’t burn and leave a bad flavour in the oil. 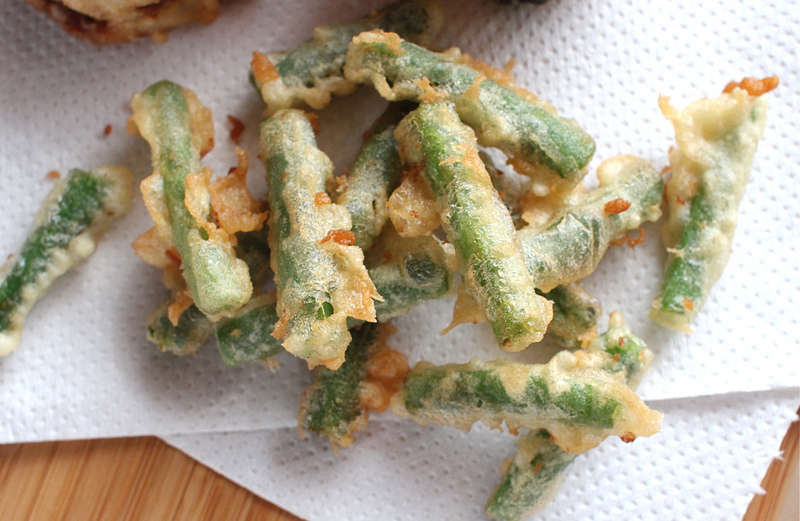 I also made tempura green beens as chips to go with the tempura lotus root meat filled burgers.